Italian plums (Prunus domesticus) are one of many types of freestone European plums that are suitable for canning and drying. When plums are dried, most people refer to them as prunes. 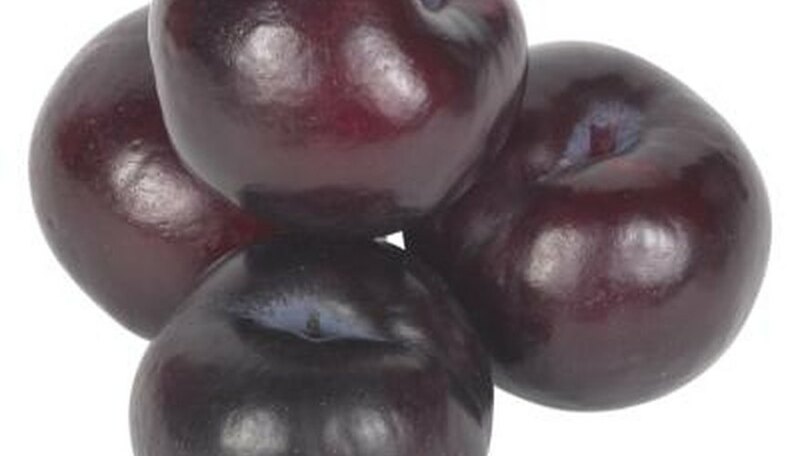 Many people favor the Italian plum as a dried fruit because of its firm, sweet flesh and attractive dark purple skin. Fresh and dried Italian plums are low in calories but high in fiber and vitamins A, C and K. Eating prunes is a time-honored method of promoting bowel regularity. Pick Italian plums at their peak of ripeness, while they are still firm. If plums are not fully ripe, allow them to ripen indoors for several days before you dry them. Discard any fruit with holes, blemishes or spots or use them as fresh fruit or to make jam. Wash all plums thoroughly in cool water to remove any dust, insects or other debris. Set them on a kitchen towel in a warm, dry, shady place to dry thoroughly. Do not allow individual plums to touch each other. Slice plums in half lengthwise after they are dry, and remove the seed from each one. An optional step is to press each fruit half with the palm of your hand to slightly flatten it. Fill a large saucepan with about 1 inch of water and set a steamer basket inside. Boil the water and then add your plum halves. Steam for one to two minutes: this process helps to reduce the amount of time it will take to dry your Italian plums. Preheat your oven to its lowest setting: ideally, you should dry plums at 135 degrees Fahrenheit. Lay plum halves flesh side down on one or more cookie sheets, leaving a small amount of space between each piece. Check your fruit after about one hour by tasting one piece: slow oven drying can take three to four hours. Leave the dried plums in your oven for at least eight hours. Dry plums in a food dehydrator if you prefer. Italian plums normally dry within 24 to 36 hours. Dried Italian plums should remain moist. Store dried plums in an airtight jar or seal them in plastic zipper bags. Freezing them for long-term storage will keep them fresh.